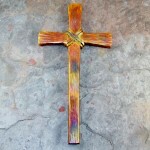 Here’s my latest project – a wood textured 100% copper cross. 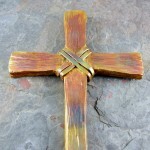 I love the wonderful colors you can tease out of copper with a torch! To join the arms to the main beam, I half-lapped the joints and then, using an oxy/mapp torch, fused them together and then put some decorative copper bands on the center. I haven’t decided if this will be mounted on a base or if I’ll be putting a hanging bracket on the back mounting on a wall. I’m really loving the oxygen torch for joining copper – I think I’m going to start looking for a larger O2 tank!